An interview with DJ Goldie has people wondering if the artist is in fact Robert Del Naja of Massive Attack. Could he be Robert Del Naja of Massive Attack? AN UNGUARDED MOMENT in an interview has renewed speculation over one of contemporary art’s great mysteries — could elusive graffiti activist Banksy be Robert Del Naja of band Massive Attack? Goldie, a well-known DJ who was a friend and competitor of Del Naja as the two sprayed Bristol in southwest England with graffiti in the 1980s, made an apparent slip of the tongue in an interview this week. Goldie was speaking with dismay at the high prices that can be fetched for works by Banksy, whose signature style is politically provocative graffiti that appears suddenly on walls around the world. “Give me a bubble letter and put it on a T-shirt and write ‘Banksy’ on it and we’re sorted… We can sell it now,” Goldie told the Distraction Pieces podcast. “No disrespect to Rob. I think he is a brilliant artist. I think he has flipped the world of art over,” he said, before pausing and switching the conversation to music. Del Naja has often been speculated to be Banksy, who as an artist makes only shadowy appearances with his face and voice concealed. Banksy has cited Del Naja as an influence and writer Craig Williams in an article last year noted that several Banksy pieces emerged in locations shortly after Massive Attack concerts. In 2008, however, The Mail on Sunday concluded after interviewing friends that Banksy was Robin Gunningham, another artist from Bristol. Banksy often produces art in charged political settings. In 2015, the artist painted a mural in the Calais “jungle” of migrants seeking to leave France for Britain. The work, The Son of a Migrant from Syria, depicts Apple co-founder Steve Jobs — who was of Syrian descent — clutching a bag of belongings and an Apple computer. Banksy earlier painted a series of images on the Israeli separation wall with the occupied West Bank, including one depicting a vacation setting with palm trees. Del Naja — who goes by the moniker 3D — and Goldie were two of the leading figures in Bristol’s graffiti movement in the 1980s, which took inspiration from the burgeoning hip-hop scene in New York. 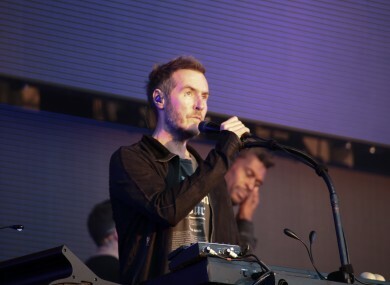 Massive Attack, led by Del Naja with Daddy G, helped create Bristol’s trip-hop sound which brought dark electronic layers to hip-hop. Email “A slip of the tongue is fuelling speculation on Banksy's real identity”. Feedback on “A slip of the tongue is fuelling speculation on Banksy's real identity”.